Civita di Bagnoregio is a unique destination: a pristine Medieval village on a promontory set in a vaste valley carved into volcanic rock by two rivers. Its only connection to the modern world is a footbridge by which you will travel the last half mile of your voyage into another world, virtually untouched by modern life. This town founded by the Etruscans, conquered by the Romans, shaped by the architecture of the Middle Ages and Renaissance is located in central Italy in the Lazio region at the border with Umbria. It survives and thrives in the heart of the Alta Tuscia, the beautiful and historically rich land of the Etruscans, and offers a gateway not only to the past but to many beautiful villages and towns in southern Tuscany, western Umbria, and northern Lazio. If you are travelling by car, Civita di Bagnoregio is 15 minutes south of the Orvieto exit on the A1 highway connecting Rome to Florence, 15 minutes east of the ancient Via Cassia connecting Rome to Siena. 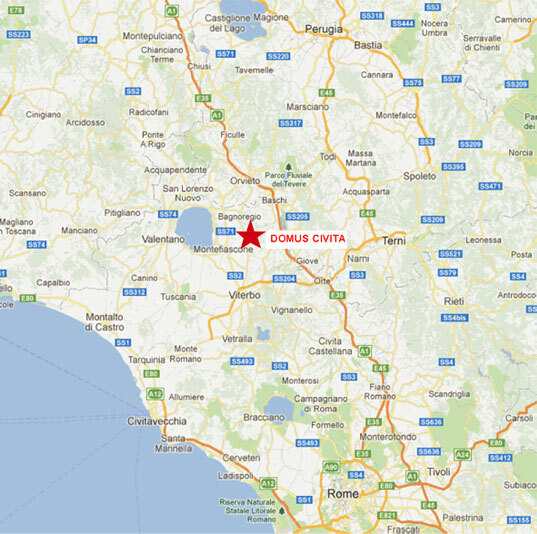 The closest train station is Orvieto which is only 15 minutes away and about an hour’s ride from Rome. The closest airport is in Perugia but Rome’s Fiumicino airport is the most convenient for international travel (1.5 hours away). While Civita is a wonderfully isolated, almost otherwordly spot, an oasis of tranquility and romance, there are several restaurants and 2 café / bars in town. You can find all the other amenities required for a pleasant stay in its sister city of Bagnoregio--the town on the other side of the footbridge and less than a mile away. This includes banks, a gas station, a weekly market, a supermarket, bakeries, and all the other wonderful shops a typical small Italian town has to offer. While Civita is famous for its beauty and links to antiquity, Bagnoregio was made famous by Fellini who filmed the movie La Strada on its streets. So geologically, geographically, historically and culturally, Civita and its environs are located at the juncture of the heart and soul of Italy! !